Hardback. Matthew Hopkins, the notorious self-styled Witch Finder General of the Civil Wars period, has been the subject of novels and a full-length film, but never before had anyone written a biography of this strange and elusive man. The author's quest for the truth about Hopkins' life took him all over East Anglia and revealed some interesting links between the Hopkins family and the notorious witch trials in Essex County, Massachussets. So elusive was Hopkins that the author began to wonder whether he ever really existed, or whether he had been a foreign interloper who had come to Britain for a few brief years and then disappeared into obscurity. For about 3yrs of his life there was a great deal of documentation of his activities as Witch Finder General, but his whole life before that was a total blank. Nobody knew where he came from, or even exactly how he died. 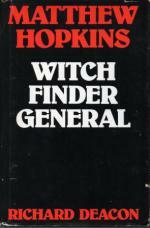 Apart from the account of the witch-trials and Hopkins' sinister technique for forcing bogus confessions from his victims, the book provides a picture of how gradually Hopkins' 3yr crusade against witches whipped up hatred against him. The author's own quest for clues to the truth about this mysterious character is in itself a fascinating sidelight on remote parts of Essex, Suffolk and the Fen Country. Often it turns up some surprising evidence - the ancient traditions of witchcraft in East Anglia, Hopkins' involvement with Cromwell's Chief of Secret Service, the discovery of Hopkins' father's will and a primitive cipher used by the Witch finders. Where this study of Hopkins is most enlightening is in the comparisons the author makes between the witchcraft hysteria of Hopkins' day and exorcism and other manifestations of occultism at the present time - even in East Anglia. Illus., Notes to Chapters, Bibliog./Sources and Index. 223pp. 8vo. h/back. Nr. F. in Vg. pcdw.